A while back I was surveying for a good portrait lens for my camera and I decided on the Tamron 90mm f/2.8 SP Di Macro Telephoto Autofocus Lens. I posted about it here and I already said that I’m getting my hands on the lens. But when I went to the shop, yes they do have the Tamron lens on sale but they actually told me that the lens is only best for macro photography. Of course I’ve done some reading on the internet before deciding on what lens to buy and I feel that Tamron 90mm was a good buy. 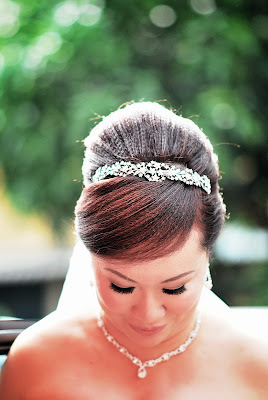 As told and reviewed by some of the photographers online, they said that the lens can be used as a portrait lens too. Pictures are sharp, autofocus is quick and quiet, bokeh is good and to their surprise as well, the lens works wonders. So I made my decision to buy the Tamron 90mm, but when I asked about it, the shop owner recommended me a different lens instead. I was a little bit disappointed that he didn’t like the Tamron and asked him why. Until when he showed me the aperture setting is not 100% at f/2.8 all the time. It increases when it can’t find a good focus point. “Ah” I said. No wonder he wouldn’t recommend me that lens for portrait even though some reviews said it’s good. So then he advised me to get a better one instead. 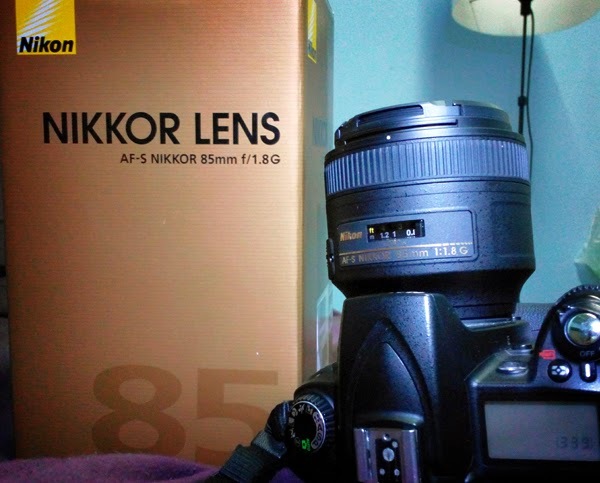 The Nikon (Nikkor) 85mm f/1.8 AF-S G lens. Although it is slightly more expensive than the Tamron, it was totally worth it. The AF-S Nikon (Nikkor) 85mm f/1.8G lens that I bought, attached to my D90. As soon as I put it on my camera for a test at the shop, I was amazed by the size of the lens. It is big, but it’s light, due to the plastic construction of the lens. Although it’s plastic, it feels sturdy and solid. The lens is also best used with a full-frame camera. So hopefully when the time comes when I have enough money to upgrade to a full-frame camera, this lens can truly show its full potential. This is only the second lens that I bought after buying the Nikkor 50mm f/1.8D a couple of years back. The 50mm did a great job for portrait and it has great bokeh effect. But the 85mm is to me, much better. 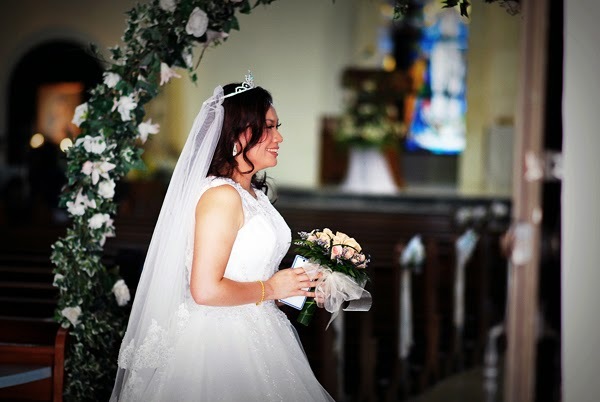 The very first test for this lens was shooting for a friend’s wedding reception. I’m using my Nikon D90 with my old kit lens with a flash gun as a primary shooter, and an older D60 as my secondary shooter with my new 85mm lens attached to it. I was thinking, the D60 is an old camera and the noise reduction is not that great so why not use fast lens on it with the widest aperture setting at f/1.8 so that it can get a clearer shot. True enough, the D60 performed beautifully with the 85mm. Anyway, here I’m showing two photos taken with the 85mm lens. I’m loving the bokeh. I’m loving the clarity of the picture and the autofocus is just so fast. I’m glad that the photography shop owner advised me to get this lens instead. Although I think the Tamron would’ve performed well too, but with Tamron’s 90mm widest aperture setting at f/2.8 won’t be as fast and as good as the Nikon 85mm. Lenses do make a lot of difference when it comes to professional photography. But don’t be fooled by marketing gimmicks too. Make sure you did some research first and ask your favourite photography shop owners for advice. They probably have a better idea on what’s best for your needs.